You've been invited to play the role of MO TOWN in Murder at the Disco. New York, 1977. Hot nightclub Disco 54 is hosting a birthday and only the coolest people are there. But before anyone can 'get down on it', nightclub owner Doctor Disco is found dead in the VIP lounge! Join us to find out whodunit! You wear a flared suit made of the finest polyester and a wide-lapeled shirt that’s unbuttoned to show off your chest hairs. Your boots don’t bite, but they used to. Chunky rings, a medallion and a fat wallet complete the look. As a teenager you were raised on a diet of James Brown and Elvis Presley. One was your father’s favourite and one was your mother’s. After a brief, failed music career trying to merge the two influences - “Papa’s Got a Brand New Pair of Blue Suede Shoes” a notable exception - you went on to form MoTown records, signing emerging talent and growing faster than anyone imagined. When you’re not in the studio, you enjoy playing croquet. There’s something about whacking balls with a mallet that resonates with you. I’m head of MoTown records, Mo Town. As my good friend Marvin would say - what’s going on? I turn up for a birthday celebration and the body count is higher than the number of cakes I’ve had to eat. 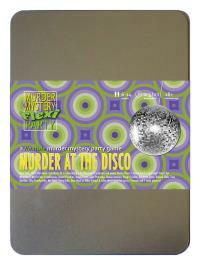 I’m not a big Disco fan, but I can see the appeal. The Doctor was a cool kid but he weren’t no Supremes. Ain’t never been in the VIP lounge, ain’t never interested in going. Anyway, who’s got two thumbs and isn’t the murderer? [Hold up your thumbs.] This guy!